I’ve been a fan of Allen & Heath mixers since reviewing a MixWizard console nearly 20 years ago. 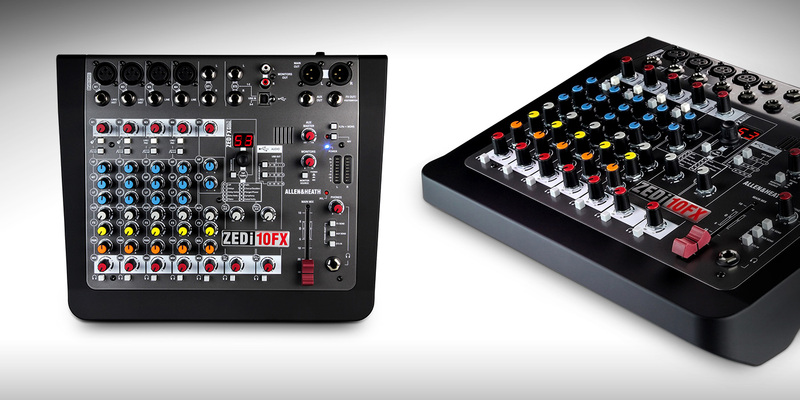 This month we review the new ZEDi-10FX, a desktop mixer/interface with surprising hidden power. The ZEDi-10FX’s layout starts with four mono input channels, labeled M1 – M4. 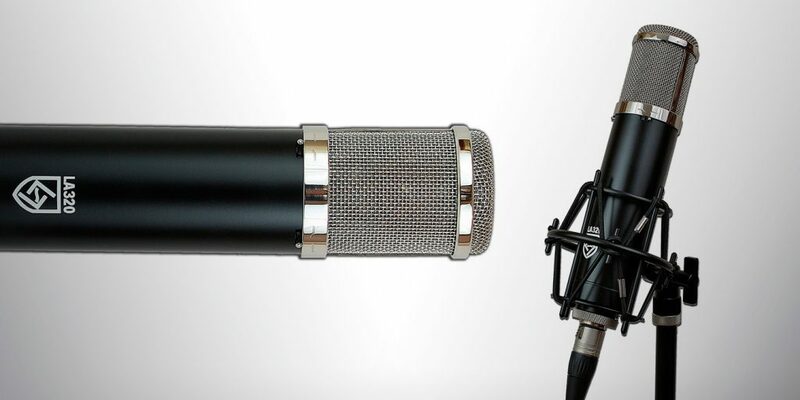 Each channel offers an XLR or balanced 1/4″ TRS input with Gain control (55 dB of gain range) and a lowcut filter switch (100 Hz corner frequency). The first two M channels have a switch to convert the 1/4″ input from line-level to Hi-Z instrument level — the specs don’t list the input impedance, but I didn’t notice any significant degradation on the sound from my test instruments’ magnetic and piezo pickups. On the other two M channels, the switch places a 20 dB pad on the inputs for hot line signals. 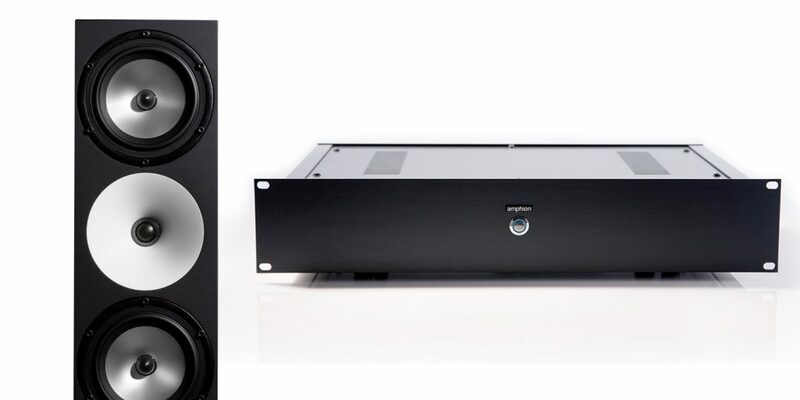 The M channels feature 3-band EQ, with shelving HF and LF bands (12 kHz and 80 Hz corner frequencies) and a broad bell MF band centered on 600 Hz. These are slightly unusual frequency choices — it’s more common to see Mid control around 1 kHz and Highs at 10 kHz — but they sound quite musical. MF adds body and heft to guitars and vocals, and the HF shelf is nice for taming overly sparkly condenser mics or adding a touch of “air” where needed. Each M channel features send pots for the Aux and FX buses. These mono buses are prefader and postfader, respectively, and would normally be used for a monitor mix for musicians and for adding delay/reverb effects to the inputs. Then there’s a Pan pot, a Mix (level) pot, and a button marked with a headphone ico-n that switches the channel over to the PFL (Pre-Fade Listen) bus. This lets you solo channels to tweak their EQ and levels easily. There are three stereo channels, each with its own I/O and features. ST1 is a full-on input channel with a pair of 1/4″ TRS inputs, Gain control, 2-band EQ (HF and LF shelving identical to what’s on the M channels), Aux and FX sends, Pan, Mix, and PFL. ST2 serves one of four different functions: you can choose whether it serves as an extra stereo input, a stereo FX return from an external processor, a stereo USB return from your DAW, or a source for the built-in FX processor. It has pots for send amount to either the Aux bus or the L/R Mix and PFL control. 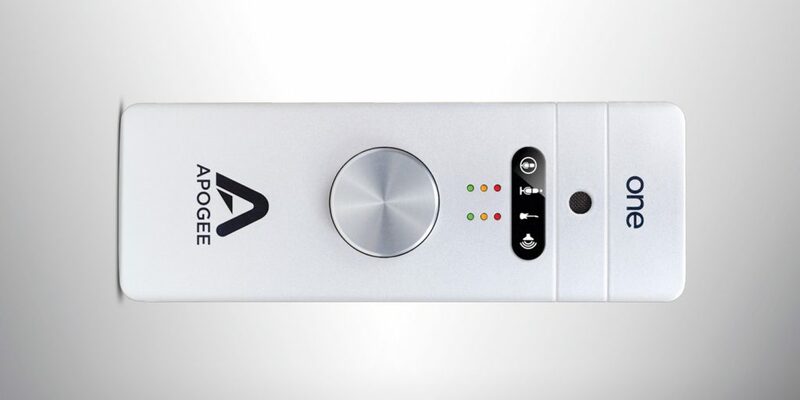 ST3 takes its input from USB and can be blended into either the Aux or Mix buses, with PFL. It also has controls for routing analog signals to the USB interface (see below). The Master section has a smooth long-throw Main Mix fader, a Phones level control with 1/4″ TRS jack and multiple input selections, a PFL indicator, dual 8-step LED level meters, Aux and Monitor controls, and a global 48V phantom power switch. There are RCA Monitor Outs, XLR Main Outs, and two 1/4″ outputs for Aux and FX sends (the latter can also be used with an on/off footswitch for the FX processor). Anyone used to cheap mixer build quality might find the ZEDi-10FX a bit startling at first. For one thing, there’s solid strain relief on every pot in the form of a tightly-set nut under each knob; you get the impression that this mixer would easily survive an accidental drop on its face. While I didn’t open the box, A&H states that every input channel lives on its own vertical circuit board, implying that this is a mixer you could actually repair rather than just throw away if a channel went bad. Oh, and there’s no wall wart; the rear panel has a power switch and 3-prong custom cable socket. Well done! While the ZEDi-10FX can do all the standard things a desktop mixer does, there’s a lot more than meets the eye at first. For one thing, having a proper PFL solo bus means that it’s really easy to tweak input signals without distraction. One lesson that novice mix engineers can have trouble learning is that if you get a sound perfect in solo, it may not work in the context of a full mix… but the flip side of this is that if you can’t solo a sound, you may miss details and nuances that will come back to haunt you later. The solo functions of the ZEDi-10FX are simple and unintimidating to the novice and encourage experimentation. Push a Listen button, the meters switch to the solo channel’s levels, and you can adjust gain and EQ with ease before putting the source back in the mix. Second, there’s a lot of monitoring flexibility under the hood. Many cheap stereo mixers give you multiple output pairs but only limited choice of what comes out of them — usually the “monitor mix” is just a clone of the main mix, at a different level. The ZEDi-10FX lets you use the Phones output to listen to the main mix, the Aux bus, the FX bus, or ST3 (so you can listen to your DAW). You can select whether the RCA Monitor Outs play back the Main Mix or duplicate whatever’s on the headphones, and there’s a button to temporarily feed that signal to the XLR Main Outs. You can build a real prefade monitor mix and feed it to the RCAs for your tracking room’s headphone amplifier while maintaining your own control room mix! Third, the built-in FX are not only actually optimized for send/return use (no distortions or harmonizers or other stuff you’d never strap across an entire bus in a conventional mix! ), but they’re actually adjustable. The engine features 61 presets with delays, reverbs, and modulation effects, alone and in combination. Each has one internal parameter that can be adjusted to taste and saved with the preset. While the standards are all here, I particularly enjoyed some of the unusual choices like the LF-adjustable Thunder Verb and the mixtures of reverb and modulation like Ambient Phase and Plate Symphonic. Fourth — and this is what really got my attention — is the unit’s USB capability. It’s got a 24-bit/96 kHz interface, not uncommon for mixers of this type… but it’s not just stereo. It’s actually 4-in/4-out! This is a huge deal for studios just getting started, as it magnifies the ZEDi-10FX’s utility tenfold. You can select if the four recording channels come from the four M inputs, or from M1/M2 and the L/R Main Mix, or M1, M2, Aux, and FX, for real control over how you get audio into your DAW. You track four instruments at a time, or record a stereo scratch mix for later overdubs while capturing “keeper” vocal or guitar tracks. How cool is that? The returns from the USB interface are two stereo pairs. Channels 1/2 can be fed to ST2 and remixed through the console’s bus structure (this is defeated if anything’s plugged into the ST2 input jacks), and Channels 3/4 come into ST3 as a stereo pair and can be auditioned on their own in the Phones/Monitor bus as well as mixed with the analog inputs. This lets you add live instruments to a DAW playback or virtual instrument rack and send the whole mix to a recorder or PA. I worked with the ZEDi-10FX for a few weeks, integrating it into my portable DAW rig as I collected material for a new album I’m working on, with voice, nylon-string (piezo input) and electric guitar and bass, keyboards, and hand percussion. The unit’s new GSPre mic preamps have tons of headroom and a very clean sound, as good as or better than anything you’ll hear in this price range. As I said before, the EQ is very musical and easy to use, and encourages experimentation, especially in combination with the PFL system. It was easy (and fun!) to get the sounds I was after. The multiple monitor routing options spoiled me for choice in a very short time, eliminating a lot of guesswork. Finally, it actually took me several days to get used to all the things I could do with the 4-channel USB interface! This alone is worth the price of admission; if you don’t feel the need for a full-on 8-channel rack interface, the ZEDi-10FX still gives you way more options than a conventional stereo unit. As you can tell, I had a lot of fun playing with the ZEDi-10FX. It offers quite a bit more in hand than many other mixers with this channel count, representing exceptional value for the money. It’s on my short list of recommendations for home-studio engineers who could benefit from something just a tad out of the ordinary.